The non-marine malacofauna of the West Indies is very rich, with many endemic species especially on the larger islands. Faunal overviews in the modern literature are, however, limited to e.g. Cuba, Jamaica, Saba, and Dominica for terrestrial snails. 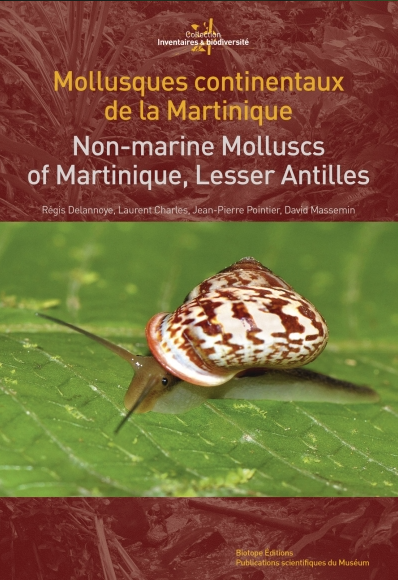 Just published now: a new book on non-marine snails from Martinique (Delannoye et al., 2015), which gives a promising first impression. The book is divided into two parts. The first part is a general introduction covering the island Martinique and the Lesser Antilles (including geography, geology, natural environments), a general introduction to molluscs and their communities, the history of malacological surveys and studies of Martinique, and threats by mankind and conservation issues. 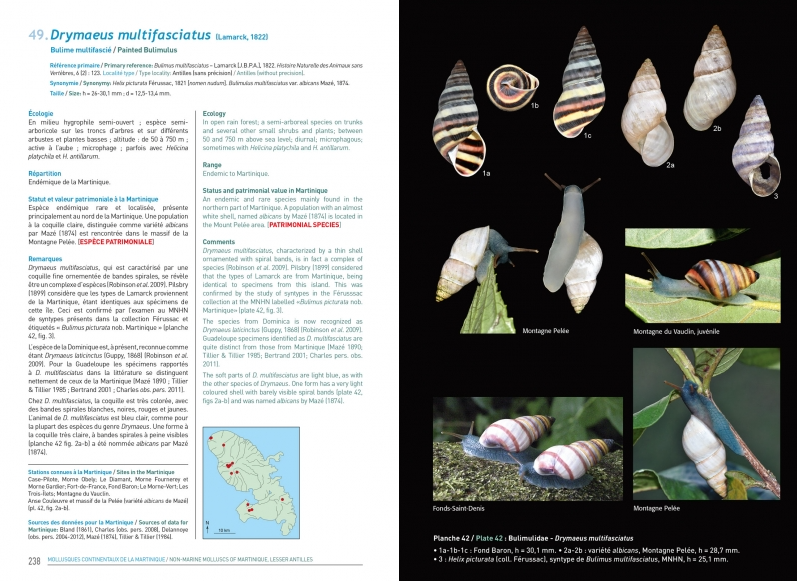 The second, a species guide, starts with an illustrated glossary and general key, followed by a systematic list of the non-marine molluscs of the island. The rest of the book deals with respectively freshwater gastropods and bivalves, and land snails and slugs. Each group has illustrated keys to families and species, followed by a systematic treatment with the primary reference, synonyms, size range, ecology, status and remarks. All species are illustrated with photographs of different shell views, as well as in most cases living animals and a map with the distribution on the island. A list of references, a synthesis of inventories and species status (‘patrimonial’, endemic, regional endemic, native (not endemic), introduced, extinct or uncertain), a glossary, and indices to species and the common French and English names complement the book. In the general part the diversity of the malacofauna on the island is compared with several other islands in the West Indies. Martinique is in the middle of the range; the legends of the graphs explaining this are slightly cryptic, so one should consult the main text. The historical account of collecting in Martinique is beautifully illustrated, and contain observations that go well beyond those for the island alone. In the part on systematics, the well-illustrated keys and maps make the information easily accessible to lay-people, and the authors have put much effort in illustrating animals and, where appropriate, specific elements of the habitat of different species. Illustrations of the genitalia are provided for freshwater gastropods only. A total of 31 (terrestrial) species is listed as ‘espèce patrimoniale’, a confusing category as it is not the same as endemic species, nor as ‘native’ species. Clear definitions seem to lack for these categories. 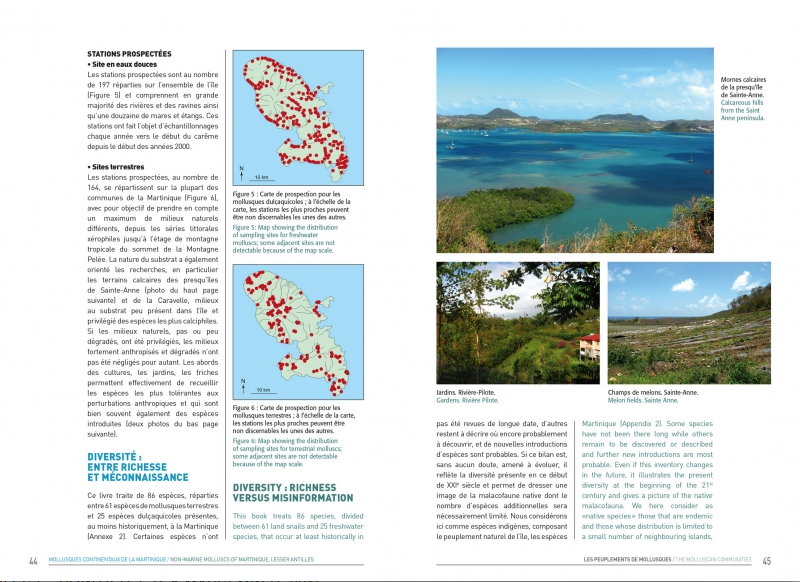 Many species treated in the book have a wider distribution than Martinique alone, and the excellent illustrations will definitely be helpful to identify material from other localities. Different colour morphs of the species are well represented on the plates. Only two species, described by Drouët, have not been recollected after their description and their original figures are given. Several species remain identified as ‘sp.’, either because the taxonomy of the group needs more in-depth studies, or because they are new to science. All together, this book is thus not the final one for this island fauna, but certainly a major leap forward and a very attractive possession for those interested in Antillean non-marine molluscs. Delannoye, R., Charles, L., Pointier, J.-P. & Massemin, D., 2015. Mollusques continentaux de la Martinique. Non-marine molluscs of Martinique, Lesser Antilles. Biotope, Mèze/Muséum national d’Histoire naturelle, Paris: 1-328, 23 + 9 + 76 text-figs, 76 pls, 3 tables, many unnumbered text-figs, photos and maps, indices. French/English. ISBN 978-2-36662-013-9 (Biotope)/978-2-85653-781-7 (MNHN). € 30 excl. postage. This entry was posted in Uncategorized and tagged literature, West Indies on January 29, 2016 by bramb.